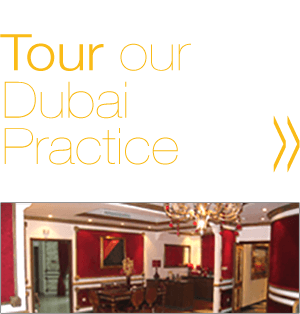 Practices locations in Denver and Dubai. Recognized and credentialed in Belgium. A neck lift is usually performed in combination with a facelift, but it is also an option as a standalone procedure for many patients. It is not uncommon for issues related to the neck to appear prior to other changes in the face. For example, loose skin may develop as a result of weight changes unrelated to aging. With a recovery time similar to a mini-lift (about 5 to 7 days), it addresses issues such as sagging skin, muscle banding (“turkey neck”), and heavy or full necks. It is performed through limited incisions behind the ear and under the chin within the natural skin crease. It is also performed under local anesthetic with oral sedation to alleviate any anxiety. Liposculpting, when performed with a Smartlipo® machine, allows for selective removal of fat and additional tightening of the skin. This is accomplished by utilizing laser technology to disrupt fat cells under the skin while preserving other vital structures that are normally damaged during conventional liposuction. It also results in minimal bleeding and a quicker recovery. Liposculpting is most commonly performed to the neck, but it also can be extended to the jowls and face. In some patients, it can be used to tighten facial tissue, alleviating the need for facelift surgery. It can occasionally substitute for a traditional neck lift. Patients who in the past were not candidates for conventional liposuction now may be great candidates for liposculpting. The procedure is performed under local anesthesia with the option of oral sedation. A forehead lift is also referred to as a brow lift and can be performed in many ways. Over time, the brows descend and droop to crowd the upper eyelid. Ideally, a female brow should be slightly above the bony rim of the upper eye, and a male brow should be at the same level as this rim. A brow lift allows for repositioning of the brow to a more youthful location. This procedure is performed endoscopically through minimal incisions behind the hairline, allowing natural positioning of the brows and removal of forehead wrinkles to soften frown lines. This minimally invasive approach allows for less discomfort, quicker recovery, and a fresher look. A temporal brow lift is a minimally invasive procedure used to lift the outer brows. It is a great option for patients who still have good overall brow positioning, but brows have dropped at the outer edges. The benefits include a shorter recovery, less swelling, and improved crow’s feet around the eyes. Laser resurfacing is an excellent method to rejuvenate aging skin. Both carbon dioxide (CO2) and Erbium lasers are used, depending on the needs of the patient. After the outer layer of the skin is targeted by the laser, the deeper, healthier skin layer provides the basis for a new skin surface. The new skin will feel tighter with fewer wrinkles and will have better tone and texture. Patients may select laser resurfacing as a standalone procedure to improve their skin, or as a complement to other facial procedures. Fat may be used as a filler to augment many areas of the face. Fat has several advantages over traditional synthetic fillers because it is the patient’s own tissue and lasts longer. Several sessions may be necessary because the body reabsorbs a certain percentage of the transferred fat. Once the desired goal is achieved, there is no need for repeat injections. Fat is usually harvested from the abdominal area and is used to add volume to the cheeks, lips, facial creases, and depressions in the temple area and jawline. This is a quick and minimally invasive procedure that addresses deep frown lines between the brows. A special suture is used to release the deep crease from the underlying tissue. It is followed by augmenting the depression with fat or some other filler. In some patients, this alleviates the need for injections, while others will experience enhanced results from injections. 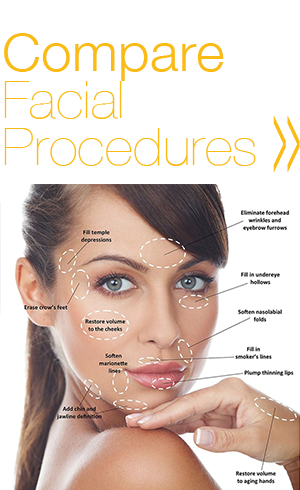 Both procedures augment the contours of the face and are typically performed under local anesthesia. Chin implants are used to increase the projection of a “weak chin,” which is most noticeable from the side view. Depending on the patient, chin implants can also improve the angulation of the neck. An incision is placed within the natural crease under the chin, which is concealed by natural skin contours. Once healed, patients perceive the implants as their normal anatomy. Cheek implants are used to augment flat and droopy cheeks, restoring youthful fullness to the mid face for an enhanced facial profile. A mid face lift is not a facelift in the traditional sense of the term. It is a procedure that elevates the cheeks to a more youthful position. It is performed through incisions in the lower eyelid and can be performed in conjunction with lower eyelid surgery. A mid face lift not only restores volume to the mid face but also softens the nasolabial crease. There are also minimally invasive alternatives that elevate the cheeks through minimal incisions behind the hairline at the temple. Buccal fat pad extraction is a procedure for reducing prominent cheeks by the proportional removal of buccal fat pad tissue. The removal of the buccal fat pad is usually done under local anesthesia; the procedure itself takes less than one hour. The buccal fat pad is removed through an incision in the mouth, towards the back of the oral cavity, near the second upper molar. The experience is comparable to wisdom teeth removal. Recovery time is usually less than a week. Dr. Khoury only practices the most advanced techniques with advantages such as smaller incisions, faster healing, and hardly-visible scarring. All procedures can be performed under either local anesthetic or mild sedation without the need for general anesthesia. Not only does this eliminate the surgical risks associated with ‘going under’ for a procedure of this nature, but it also reduces any fears people might have about receiving general anesthesia. This is just another testament to the skill and ability Dr. Khoury passes on to all of the patients who trust him with their appearance. A facial rejuvenation procedure can be a life-changing experience, improving the way that you feel about yourself and giving you a sense of confidence and well being. Dr. Khoury is an expert in facial rejuvenation techniques and will work with you to determine the procedures that will be best for you based on your goals and preferences. It is important to recognize that for all medical procedures, including the procedures performed by Dr. Khoury, individual results and experiences may vary. Dr. Khoury is double-board certified in Facial Plastic Surgery and Otolaryngology/Head and Neck Surgery. 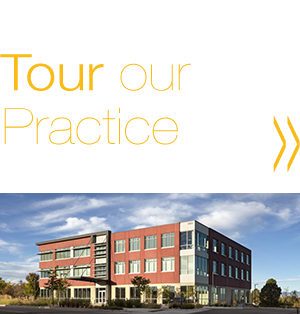 He operates out of a state-of-the-art facility that is fully accredited by the AAAHC (Accreditation Association for Ambulatory Health Centers). * Pricing is for the U.S. only.